While I'm not someone who likes to purchase a lot of items to decorate with, there are times when something catches my eye and I know it is for me. It sounds strange and not everyone is the same, but I feel as though I am a person who listens to her heart when she shops. I don't necessarily buy based on what is trending or that I see my favorite bloggers using. Instead I buy what "speaks" to me. And when there is something specific that I'm looking for, it normally takes me awhile to find it as I refuse to settle for "good enough." 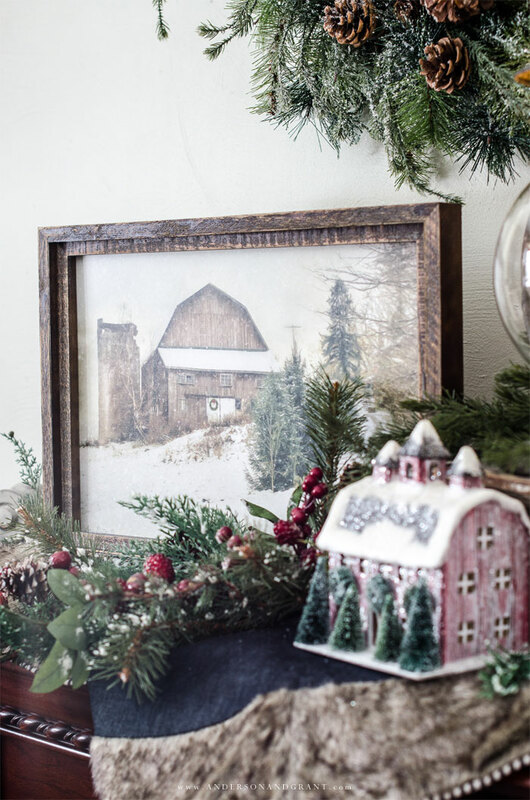 A few months ago while shopping at Hobby Lobby, I fell in love with this picture of an old barn and knew immediately that it was what I needed for my Christmas mantel this year. It reminds me of driving through rural areas and seeing the old farmhouses and barns that are still standing after so many years and generations of family living there. We live in a world where everyone seems to be craving the "modern" farmhouse with nothing out of place or in need of repair. But I actually love seeing real working farms where things might not always be pretty or perfect, but they are lived in and loved. A place where beauty can be found in the aged barn wood and screen door that squeaks when you close it. 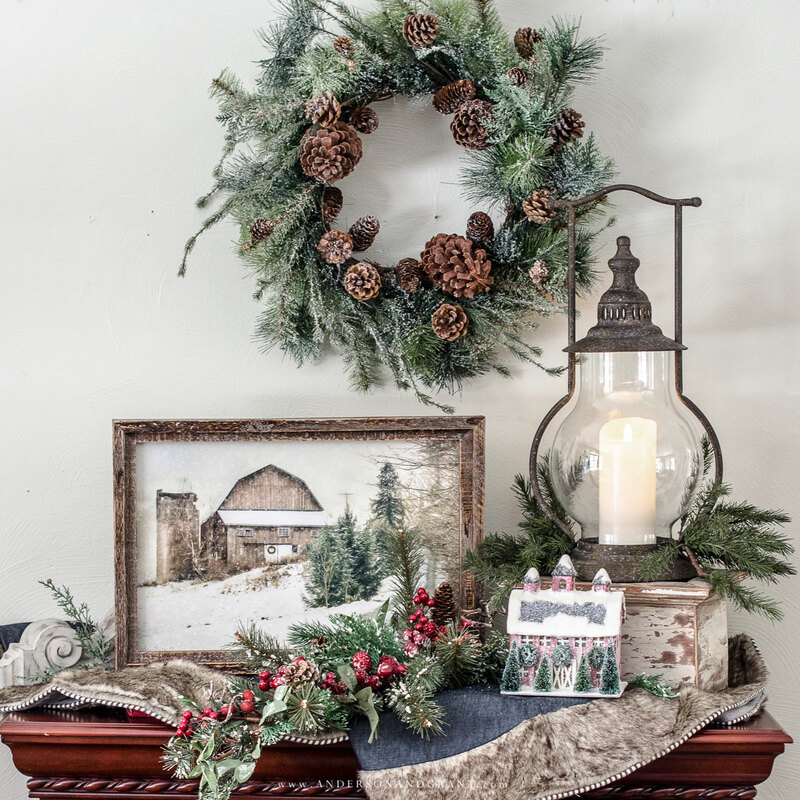 As we are decorating for Christmas, it is so easy to fall into the trap of thinking everything has to be perfectly placed and done just like everyone else. 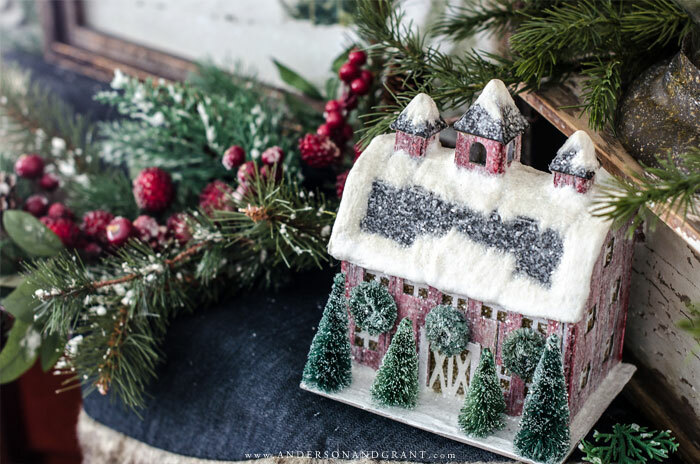 But I hope that this year you can listen to your heart, buy things that you will truly enjoy year after year, and decorate in a way that may not be perfect, but allows you and your family to feel love and experience the joy of the season. 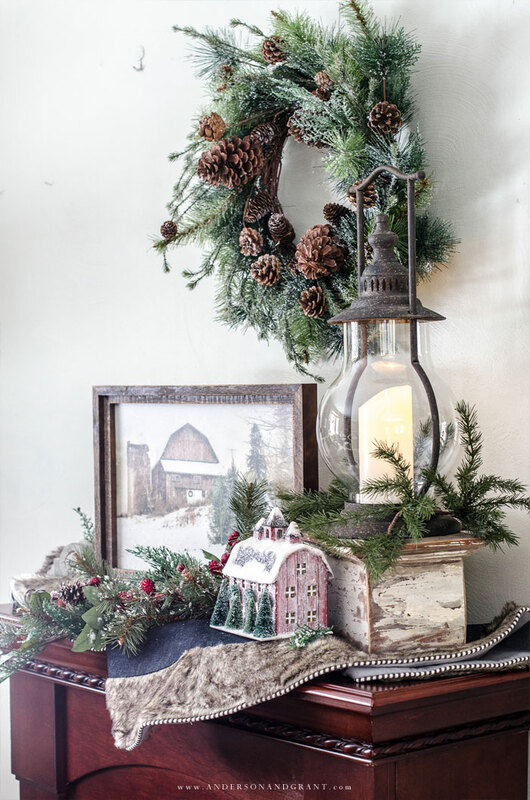 When putting my vignette together, I wanted to stick with a more rustic, cozy theme. The barn in the picture was reinforced by this pretty snowy red barn. 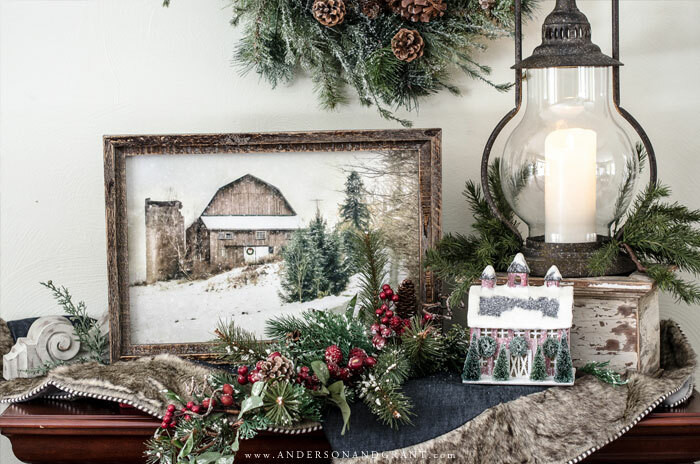 And then I added a few more red touches with the berries in the greenery and plaid on the stocking. The metal lantern gives a little height by sitting atop a wood box with chippy white paint. 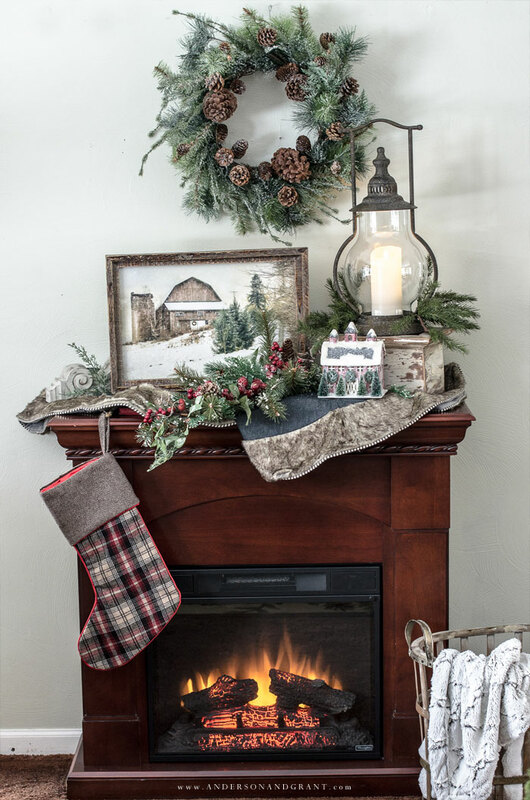 And to add a little cozy texture and warmth to the objects, I decided to use my new denim and faux fur tree skirt in a thinking-outside-of-the-box sort of way and instead draped it over the top of the mantel. Nothing too complex or perfectly placed, but I really love how it all came together. What was created was a place where I'm all too happy to curl up beside with a cup of hot chocolate! 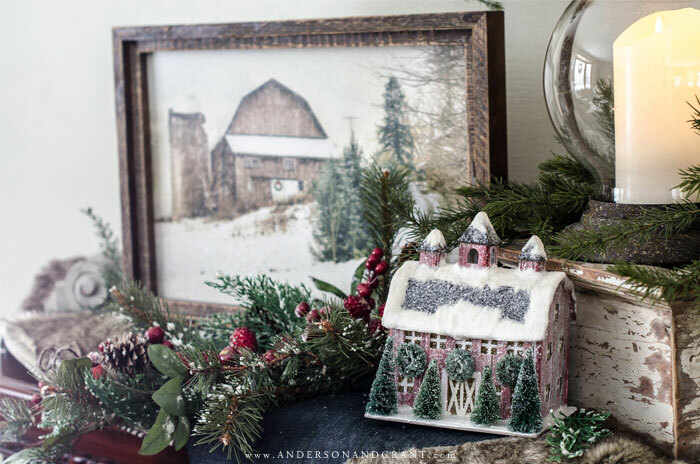 Thank you so much for taking the time to visit my blog today, and I hope you found a little inspiration for your holiday decorating. 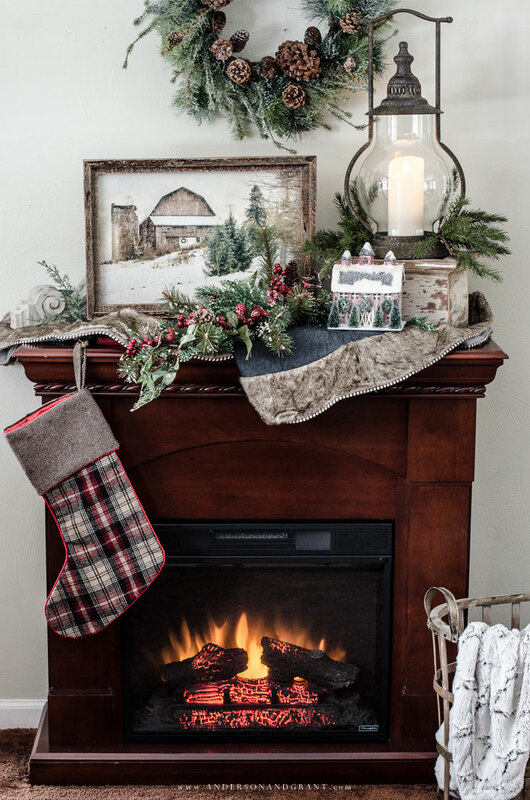 Now I'd love for you to continue on the tour and leave a little love for Kristen of White Arrows Home and her beautiful mantel! 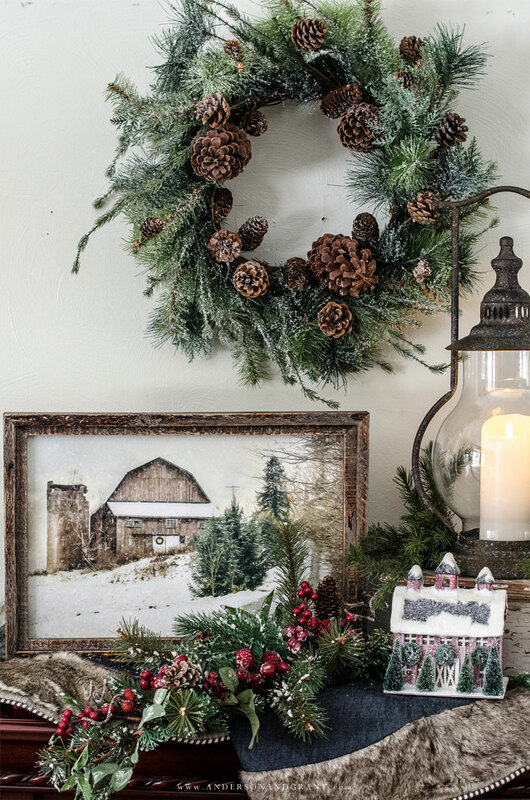 My friends below are sharing their own decorating ideas, DIY projects, and recipes for the holiday season. Please take a moment and visit some of the links for more even more ideas!